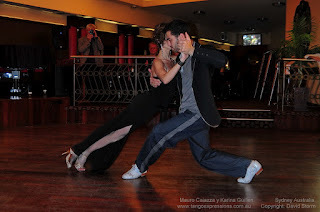 You can watch their performance last Friday at Tango Pasion's milonga on Facebook where you will also find details on the remaining workshops - I believe there is actually a shortage of women at one of them!! Thank you to David Storm for the photos taken on Sunday. So great to see that tango is growing in Sydney. I lived there for a while in 2009 and there is so much that is new and interesting.